Recipe: Vegan BBQ Sandwich. In 5 Minutes. 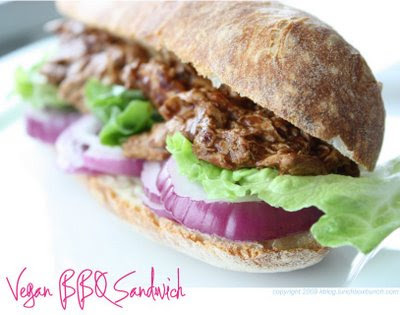 This recipe for a Vegan BBQ Sandwich uses Trader Joe's Chicken-less Pulled Chicken. From start to first bite it will only take you five minutes to prepare the sandwich. Really. Poke 2 small holes in TJ's BBQ pulled "chicken" plastic pouch. Heat in microwave for 2 minutes. Slice bread down center to apply ingredients. Spread 1 tsp olive oil on inside of bread. Apply layer of red onion slices. Apply a thick layer of BBQ chicken. Use about 1/2 the package for 17 grams of protein. Store remaining "chicken" in fridge. Read my full review about TJ'S Pulled BBQ Chicken.